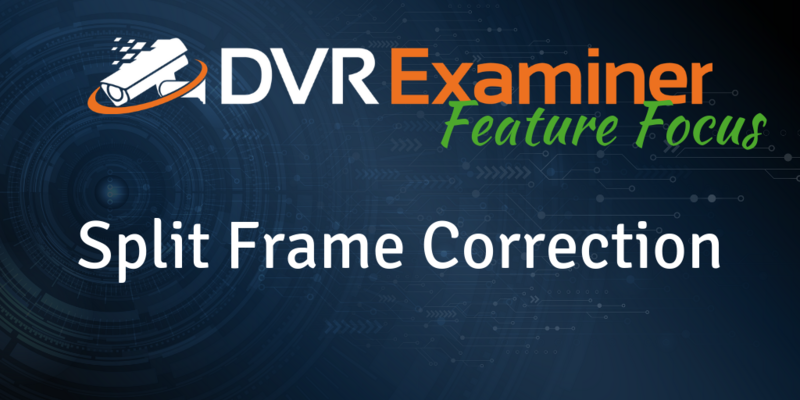 Feature Focus: Split Frame Correction - DME Forensics Inc. Depending on the file system of the DVR hard drive you are scanning, you may come across a distorted split frame video clip when previewing. At first glance, it appears the same video frame is displayed twice, however, what you are seeing is half of the frame displayed on the top and half of the frame displayed on the bottom. Why do they look the same? Due to the way some DVRs write data to the hard drive, the rows of data of the video frame may not have been in the correct order. When DVR Examiner scans the hard drive and looks for the video frames, it returns the frame information in the same order that the data has stored to the hard drive. In this example, the top half of the frame (lines 1,3,5,7 and so on) displays the top field, while the bottom field (lines 2,4,6,8 and so on) displays in the bottom half of the frame. Since the changes between successive lines are minimal, each field looks the same. Some DVRs may also reverse the order and display the bottom field at the top of the frame, and the top field at the bottom of the frame. DVR Examiner 2.5 introduced a new feature to correct the way these frames are displayed. The “Split Frame” button allows the user to enable “top field first” and “bottom field first” corrections. By default, Split Frame correction is off. That means all frames are displayed with the rows in the same order as received from the hard drive. On the first click, the “Split Frame” button displays “Top Field First.” This setting means that DVR Examiner re-organizes the video frame so that the first line of the top field is displayed first. The image below provides an example of this frame order. If the image still does not look accurate, click the button again to switch to “Bottom Field First.” This setting means that DVR Examiner re-organizes the frame assuming that the first row is in the bottom half of the frame. Toggle between Top Field First and Bottom Field First to determine which image looks correct so you can review the video with ease within the DVR Examiner preview. It is important to note that this button only affects preview within DVR Examiner 2.5. The exported footage appears the same as it would on the disk.